Optical spectroscopy techniques are now widely used in the study of biomolecules and their functioning within live cells. Raman micro-spectroscopy(RMS) as one such technique is now being investigated as an alternative diagnostic tool to established techniques such as histopathology, as a means of determining the state of health of a living cell. Larraona-Puy and co-workers  from the University of Nottingham have shown how Raman micro-spectroscopy can be used to discriminate basal cell carcinoma from surrounding healthy tissue including that associated with hair follicles. Their work is particularly relevant to developing alternative ways of diagnosing carcinomas and aiding in microsurgery. Skin cancer is the most common type of cancer among humans and basal cell carcinoma (BCC) account for ~8 out of 10 diagnosed cases. Mohs micrographic surgery (MMS) is considered the most suitable treatment for difficult cases and when maximum tissue conservation is required, for example when carcinoma are to be removed from the face of a child. It involves a stepwise surgical removal of the cancerous tissue. A key challenge in this procedure is preserving the maximum amount of healthy tissue whilst ensuring removal of all the tumour. Histopathology is the standard technique for determining the boundary between the tumour and healthy tissue. However, histopathology diagnosis is subjective, invasive, and time consuming; this can lead to long procedure times for the patient as every biopsy has been to be taken to the lab and analysed to assess if further surgery is required. Having an alternative tool which is automated, objective and fast at distinguishing between cancerous and non-cancerous tissue underpins the motivation for research in this area. Larraona-Puy and co-workers have demonstrated how Raman micro-spectroscopy(RMS) may form the basis of such a tool. Figure 1 shows a schematic diagram of their RMS experiment. It consisted of an inverted microscope (Olympus IX71) with a highprecision automated XYZ translation stage (H117, Prior Ltd.). A CW diode laser at 785nm (XTRA, Toptica) was delivered via the objective lens to scatter off the sample cell molecules. The objective lens had a magnification of x50 and a numerical aperture of 0.75. The Raman and Rayleigh scattered light from the cells was collected and coupled back through the objective lens towards the spectroscopic system. The latter consisted of a Shamrock SR303i spectrograph with an iDus back illuminated-deep depletion (BRDD) CCD camera(DU401A-BRDD, Andor). The BRDD sensor ensured high sensitivity and the elimination of any adverse etaloning effects when working at the near-infrared wavelengths used in this work. 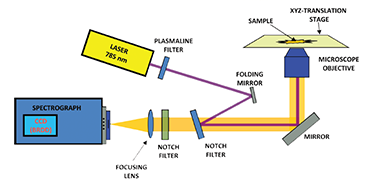 A filter was used in front of the laser to ensure a stable excitation wavelength on the sample and notch filters were used to eliminate the Rayleigh scattered light from the important Raman signal which was then focused into the spectrograph; one notch filter facilitated coupling of the excitation beam on to the optical axis of the microscope. Raman spectroscopy provides ‘fingerprint’ spectra which are characteristic of particular types of molecules within the tissue cells. 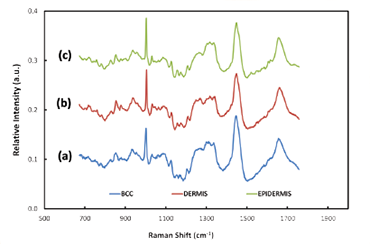 Analysis of the difference between Raman spectra can be used to distinguish between epidermis, dermis and BCC tissue . Chemometric analysis is required to achieve this end. The researchers constructed a model using selected Raman bands showing the largest spectral differences between normal and abnormal tissue, and linear discriminant analysis (LDA), with a view to optimising the sensitivity and specificity capability of their model; the model was able to discriminate between BBC and healthy tissue with sensitivity of ~90% and specificity of ~85%. They then could proceed to build up 2D images using Raman mapping on in-vitro sections of tissue – a key requirement when allowing clinicians to decide where the boundary lies between healthy tissue and the tumour. Figure 2 shows some illustrative Raman spectra for healthy and tumorous tissue. Assessment of the potential effectiveness and accuracy of the technique was carried out by comparison of the Raman derived images with the corresponding hispathology images. The latter were acquired after the in-vitro Raman measurements were completed. Figure 3 shows a Raman pseudo-coloured image derived from the Raman data and for comparison the corresponding hispathology image. The group’s results demonstrated the ability to identify the presence or absence of tumorous tissue without the need for histopathological assessment. Figure 2: Typical Raman spectra acquired from BCC tissue (a), and healthy tissue - dermis (b) and epidermis (c). The Nottingham group has extended the applicability of their model to discriminate between hair follicles and BCC . Raman micro-spectroscopy does offer the potential for that automated, objective and accessible tool for tissue analysis which in due course may extend the wider use of Mohs microsurgical procedures in medical treatments.